Last night I attended a media event at Hospoda here in NYC where they showcased their unique draft system by pouring Pilsner Urquell and couple Brooklyn Brewery beers. 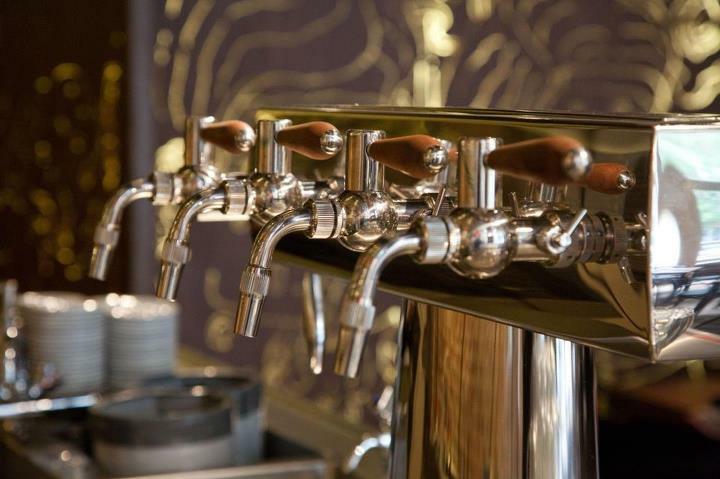 Hospoda has been on my restaurant list for a while and while their food gets rave reviews what caught my interest, when I first heard about them almost a year ago, was their draught system they call the Bohemian Beer Quadrunner. They use this to pour Pilsner Urquell in four different ways, each giving a different flavor. Four different Pilsner Urquell pours. Sweet (top left), Slice (top right), Creme (bottom left), Neat (bottom right). Images courtesy Hall Company. As soon as I walked in I was handed a small glass (not the mug pictured above) that was mostly foam and told to drink it quickly. Since I’m always up for a drinking challenge (and they were providing beer and snacks) I obliged. My first thought was this tastes like it was poured out of a nitro tap. My second was that this was sweet, without the bite I normally associate with Pilsner Urquell. As I later learned, they use standard CO2 but their tap system aerates the beer and the bartender can vary the flow coming out to create anything from a standard pour to the foamy “Sweet” I just had. 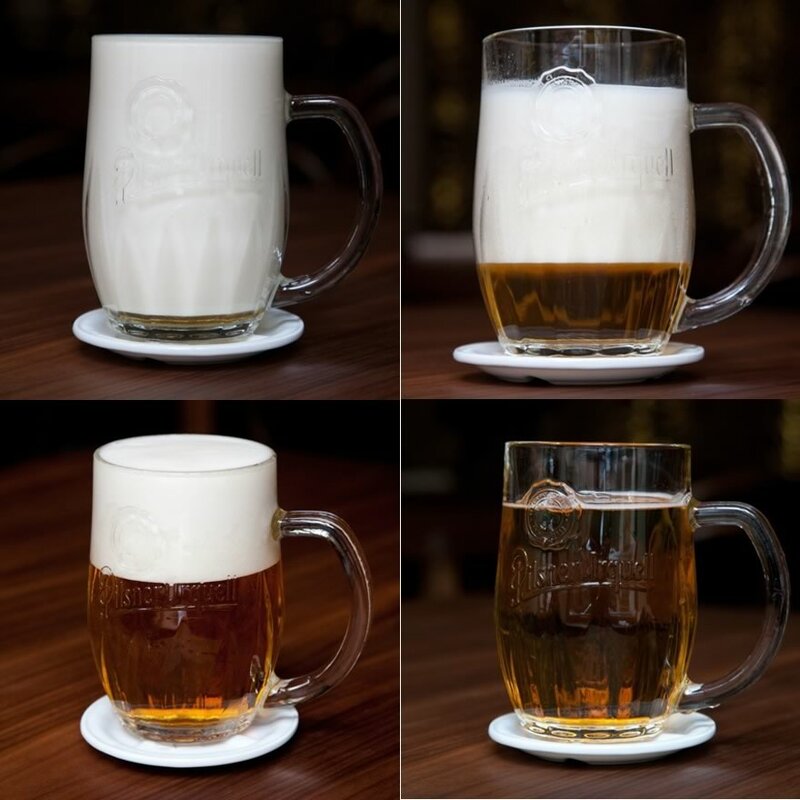 I moved through their other Urquell pours, each one with less head and creaminess: Slice (four fingers of head); Creme (normal head–the classic way of pouring a Czech pilsner I was told); and Neat (no head). It was definitely an interesting way to taste the same beer and I’d recommend getting flight and enjoying all four. Hospoda worked with Pilsner Urquell to create the “cold shipped express” initiative to get the beer from the brewery in the Czech Republic to the US in just two weeks, refrigerated throughout the journey. They take their beer seriously and the attention to detail in pouring, serving, and caring for the beer is noticeable. The centerpiece of the restaurant is the bar that houses the Quadrunner with a plexiglass floor in front of it that looks down into their spotless, well-organized beer and wine cooler. After the Urquell I decided to try Brooklyn Brewery’s current Brewmaster’s Reserve, There Will Be Black, a hoppy black ale I had a month or so ago at the brewery. I liked it there and also when poured through Hospoda’s Quadrunner. Was it better? Worse? I have no idea since I don’t have tasting notes or a memory to speak of. After only serving Pilsner Urquell since they opened about a year and a half ago, why add Brooklyn Brewery’s beers? Hospoda started by purchasing a sixtel of Brooklyn Lager to try on the system and invited the owners and brewmaster Garrett Oliver to stop by to taste it—where they noted it tasted as fresh as it does from the brewery when poured through the Quadrunner. If you are looking for a good, interesting beer experience that you can’t get anywhere else in the US along with some great Czech-inspired food I’d definitely check it out. There’s something for both the beer geeks and foodies in your party. Disclaimer: At this event I and the other attendees received complimentary: beer and snacks from Hospoda; a complimentary mug from Pilsner Urquell; and a complimentary bottle opener from Brooklyn Brewery.